When thinking about installing solar panels on your roof, you may wonder if solar panels work in cloudy weather. Of course, your panels will generate the most solar energy on days when they receive an abundance of peak sunlight. But that doesn’t mean they won’t produce on cloudy days. As you would expect, the variance in solar energy that solar panels produce on cloudy days depends on the density of the clouds. But, in general, if you live in an area where you have many cloudy days, you still can generate plenty of solar energy. When considering solar power to help save money on your utility bill, it’s not cloudy days that matter but how much peak sunshine your roof gets during the entire year. If you have a slew of sunny days and are generating more power than you need, you can send that power back to the electric company for later use. This means that even if you live in an area that isn’t known for its sunshine, you will get enough sunshine during the year to power much of your home’s needs. You may be surprised to know that Germany gets the same amount of sunshine as Alaska, which ranges anywhere from 2.5 to 3.3 peak hours of sunlight a day. Here’s another surprise: Germany is among the world’s leaders in solar power, but it gets far less sun than a state such as Ohio. For example, Ohio ranks very low when it comes to clear, sunny days. When looking at the average for the entire state, Ohio could rank as low as 44 out of 50, depending on the weather patterns. Despite the winter weather, Cleveland still gets enough sunlight throughout the year to make solar viable. The cool Ohio weather is an advantage for solar panels since solar panels work more efficiently when they don’t get too hot. In an area with extreme summer heat, solar is slightly less efficient. If someone you know has solar panels, ask them about how their panels perform on cloudy days. They may report a strange phenomenon. On partly cloudy days, their solar system may exceed its power rating and generate more energy than it does on a sunny day. Called the “edge of cloud effect,” this happens when a cloud passes in front of the array. The sunlight is magnified as it passes through the moisture droplets in the edge of the cloud. Combined with other conditions such as sun angle, temperature, and minimal shading, your solar system’s power output is boosted temporarily. This phenomenon helps balance out the losses from days with full cloud cover. Similar power boosts can happen when sunlight is reflected off of water or snow. 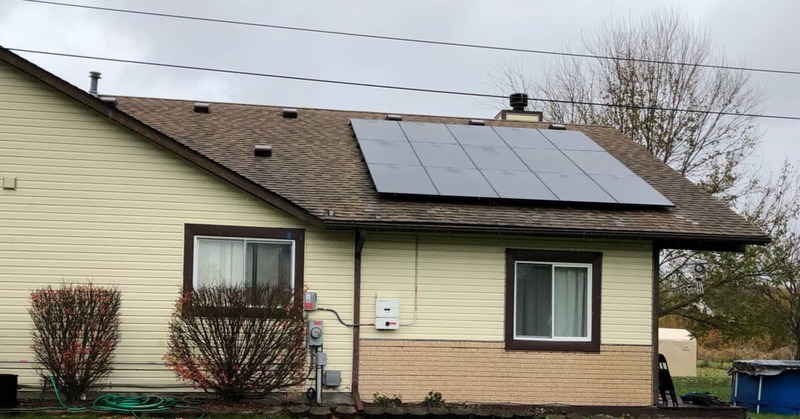 If you live in an area with cool, cloudy weather such as northeastern Ohio, you still can save money with a solar power system. Sunny days are just one thing to consider. Not only will your solar panels continue to work on cloudy days, but there are also times when they will produce just as much, or more, solar energy than they will on a sunny day.